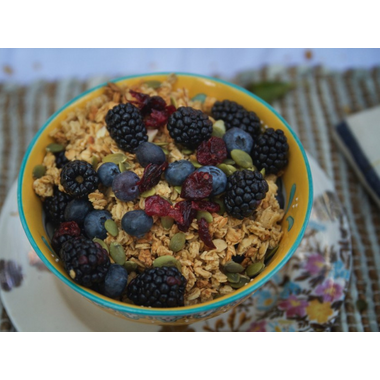 Enjoy the burst of cranberry flavour mixed with crisp roasted pumpkin seed for this enjoyable breakfast cereal or snack. Enjoy your breakfast like nature intended. The health benefits of consuming cranberries include lowered risk of urinary tract infections, prevention of certain types of cancer, improved immune function, decreased blood pressure. Pumpkin seed benefits include heart healthy magnesium, zinc for immune support, plant-based Omega-3 fats and prostate health. 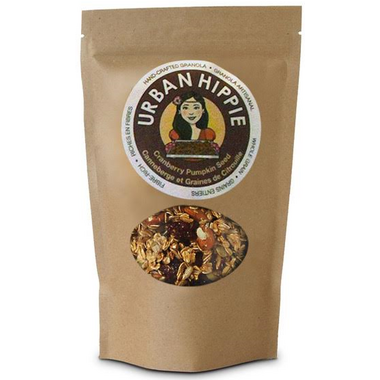 This Urban Hippie Granola also goes great on yogurt, with milk or by the handful. Perfect for pre/post workouts. 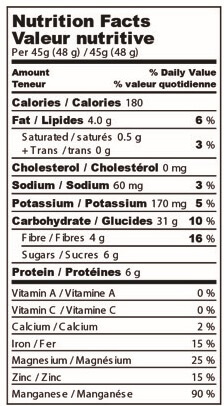 Ingredients: Non-GMO Oats, Organic Cranberries, Organic Pumpkin Seeds, Canola Oil, Brown Sugar, Sea Salt, Cinnamon, Vanilla. I did not enjoy. I found it had too much sugar and was way too sweet for me. I have bought their Maca Matcha before and love it but this was the first time I tried the Cranberry Pumpkin. Very yummy and I will be buying it again! I love all of the Urban Hippie Granola flavours but my all time favourite is the Cranberry Pumpkin Seed! I never leave home without it in hand or in my purse! I love all of the flavours by Urban Hippie but this one is my all time favourite! I do not leave my house without a bag of it in hand or in my purse. It was absolutely delicious! The pumpkin seeds added the perfect crunch to a sweet and amazing mix.